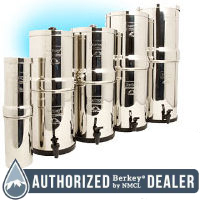 Berkey® water filters are gravity flow systems that incorporate Black Berkey® ‘elements’ (filter cartridges) with outstanding water purification capabilities. Berkey® filters require no electricity or pressurized water delivery, making them an exceptional choice for outdoor use and emergency situations as well as for day-to-day use. They can be used to filter both municipally treated water and untreated raw water from sources such as lakes, streams, stagnant ponds and questionable water supplies in foreign countries.